← B-fest 2017 schedule line-up – exposed! The latest PFS has been given our blessing and they’ve already had our buddy David “The Rock” Nelson up for a special show. Now they’re ready for their first big event, a 35mm screening of DEMONS and NIGHTMARE CITY! 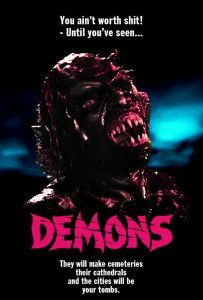 This entry was posted in News and tagged demons, events, gore, horror, Italy, Movie, zombies. Bookmark the permalink. I missed this double feature, can it be run again?